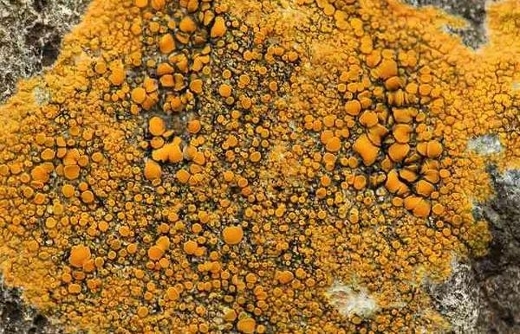 Parietin, shown to have anticancer activity in the laboratory, is a dominant pigment in Caloplaca lichens. Photo courtesy of www.aphotofungi.com. Note for reporters: this research did not assess the effects of rhubarb or lichen in the diet. An orange pigment, found in lichens and rhubarb, called parietin may have potential as an anti-cancer drug, scientists at Winship Cancer Institute of Emory University have discovered. The results were published in Nature Cell Biology on October 19. "This is part of the Warburg effect, the distortion of cancer cells’ metabolism," says Chen, professor of hematology and medical oncology at Emory University School of Medicine and Winship Cancer Institute. "We found that 6PGD is an important metabolic branch point in several types of cancer cells." The research at Emory was supported by the Winship Cancer Institute, the National Cancer Institute, the Department of Defense, the Charles Harris Run for Leukemia and the Georgia Research Alliance. Some co-authors of the paper are employees of Cell Signaling Technology Inc.